Mexico City (Spanish: Ciudad de México, México D.F. or simply México, pronounced IPA: ['mexiko]) is the capital city of the nation of Mexico. The "Distrito Federal" is also commonly referred to as the "D.F." It is one of the largest cities in the world and is classed as a megalopolis as it encompasses one large city that has slowly engulfed other, smaller ones. It is located in the Valley of Mexico, a large valley in the high plateaus at the centre of Mexico, about 2,240 meters (7,349 feet) above sea-level, surrounded on most sides by volcanoes towering at 4,000 to 5,500 meters (13,000 to 18,000 feet) above sea-level. Officially, the name "Ciudad de México" is used by the Distrito Federal (D.F.). The D.F. is a federal district serving as the capital of Mexico and which is administered by the Mexican Federal Government. The D.F. encompasses the historical centre of Mexico City, but is much larger than the historical municipality of Mexico City abolished in 1928. The urbanized area of Mexico City covers only the north of the D.F., while the south of the D.F. is made up of rural areas and mountains. Although the D.F. is not a municipality, the name "Ciudad de México" is used by Mexican authorities as a synonym for the Distrito Federal (Federal District). 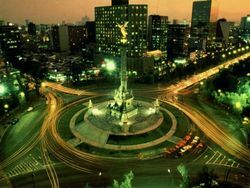 Mexico City, with its distinct mestizo culture, blending native Indian ( Nahuatl) and Spanish heritages, has in recent decades become one of the great financial, economic, educational, cultural, and tourist centers of the world. The original Aztec city was established in 1325 as Tenochtitlan, and immediately became the centre of a growing Empire. Located on a small island on the middle of Lake Texcoco, the layout of the city forced the Aztecs to build artificial islands (chinampas) and create a series of canals to allow the growth of the metropolis. In fact, although the lake was salty, dams built by the Aztecs kept the city surrounded by clear water from the rivers that fed the lake. Two double aqueducts provided the city with fresh water; this was intended mainly for cleaning and washing. After centuries of pre-Columbian civilization, the Spanish conquistador Hernán Cortés first arrived in the area in 1519. He did not succeed in conquering the city until August 13, 1521, after a 79-day siege that destroyed most of the old Aztec city. 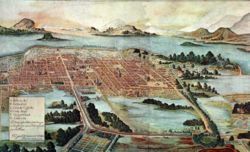 In 1525 the rebuilt city served as the capital of the viceroyalty of New Spain and the political and cultural centre of Mexico. The importance of the city was such that the Captaincy General of Guatemala, Cuba, Florida, and the Philippines were administered from it. This colonial period culminated with the construction of the baroque Metropolitan Cathedral and the Basilica of Guadalupe. In 1824, the Mexican Federal District was established by the new government and by the signing of their new constitution, adapted off of the American one. Before this designation, Mexico City had served as the seat of government for both the State of Mexico and the nation as a whole. Toluca became the capital of the state of Mexico. The war with the United States led to an invasion into Mexico City by U.S. General Winfield Scott on Sept. 14, 1847, and obligated Mexico to cede the States of California, Arizona, Colorado, Nevada, New Mexico and parts of Utah to the U.S. and recognize Texas as independent. The invasion culminated at the Castillo de Chapultepec (Chapultepec Palace) where young Mexican cadets (see Niños Héroes) fought helpless and outnumbered to keep the Americans from taking the symbolic castle. This event is remembered by a series of monolithic columns that bear their names at the base of the Castle. The short lived monarchy in 1864, led by Maximilian of Habsburg left its mark on the reconstruction of Chapultepec castle and other urban planning that was said to have been modeled after the Champs Elysee to help his wife Carlotta adjust to the city. A three decade long dictatorship under Porfirio Diaz left a French influence upon Mexico City. The stunning, gold Angel of Independence was built under his administration to celebrate the first centenary of the beginning of the War of Independence. Other urban highlights built at the time were the Palacio de Bellas Artes and the expansion of Paseo de la Reforma a la Champs-Élysées. Mexico City suffered from the Decena Trágica in February 1913. The Decena Trágica was a battle between Francisco I. Madero's forces and Felix Diaz's. The result was a massacre of civilians and a destroyed city. The post-revolutionary government of Mexico following the Mexican Revolution of 1910 reinforced the importance of the city which saw an important influx of immigrants during the rest of the 20th century. Most of the growth of Mexico City in population occurred in the late 20th century. In 1950, the city had about 3 million inhabitants. By 2000, the estimated population for the metropolitan area was around 18 million. 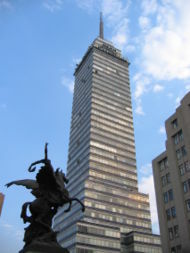 Torre Latinoamericana, first Mexican skyscraper. In 1968, the city hosted the Olympic Games, an event marred by the massacre of hundreds of students in what came to be known as the Tlatelolco Massacre. Another sporting event hosted by the city was the 1970 FIFA World Cup, the final match of which took place in the Estadio Azteca. mexico city pic At 07:19 on September 19, 1985, the city was struck by an earthquake of magnitude 8.1 on the Richter scale which resulted in the deaths of between 5,000 (government estimate) to 20,000 people and rendered 50,000-90,000 people homeless. One hundred thousand housing units were destroyed, together with many government buildings. Up to USD $4 billion of damage was caused in three minutes. There was an additional magnitude 7.5 aftershock 36 hours later. USGS Earthquake Report. When Mexico City hosted the FIFA World Cup again in 1986, it was seen as evidence of its rapid recovery. During the 1990s, Mexico City continued to grow as an economic and cultural centre of international importance. The construction of new skyscrapers such as Latin America's tallest building, the Torre Mayor (a literal translation of which is Greater Tower), and World Trade Centre México (a remodelling of the Hotel de México, built in the 1970's) and the never ending influx of immigrants made such development possible. Mexico City, as a municipality, had mayors (alcaldes, later known as presidentes municipales) until 1928 when the municipality (officially known as municipalidad de México) was abolished and its ayuntamiento (city hall corporation) disbanded. 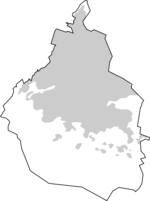 The municipality has never been recreated but in 1987 and 1993 local powers devolved from the federal government of Mexico to the inhabitants of the Mexican Federal District (Distrito Federal or D.F., within which lies the former municipality of Mexico City), and in 1997 the inhabitants of the D.F. were allowed for the first time to elect a Head of Government of the Federal District (Jefe de Gobierno del D.F. ), who was previously appointed by the president of Mexico. Leftist leader Cuauhtémoc Cárdenas was the first elected Head of Government of the D.F. in 1997. The current (and fourth) Head of Government of the D.F. is Alejandro Encinas Rodríguez. The Head of Government of the D.F. is often presented to people outside of Mexico as the "mayor of Mexico City". Mexico City is an important financial centre of Latin America and virtually every foreign and domestic corporation has operations in the city. It produces 25% of Mexico’s $815 billion Nominal GDP ($1.1 trillion in PPP GDP) making Mexico City alone the 30th largest economy in the world. In addition, it is one of the most important cultural centers in the world boasting more museums than any other city. It has the fourth highest quantity of theaters in the world after New York, London and Toronto. On November 06, 2006, three small Semtex bombs exploded in the back door of the Federal Electoral Tribunal, the auditorium of the Institutional Revolutionary Party headquaters and a branch of Scotiabank. A number of unexploded devices were also found in a different Scotiabank branch and a Sanborns restaurant. Authorship of the attacks and their motive is unknown, though it has been speculated that a guerrilla group may be behind them. In general, colonias are a recurrent feature in Mexican cities and larger towns. They are the basic geographical unit in Mexico City and in contrast to the delegaciones (the boroughs of the Mexican Federal District) they are always included in a persons address. However colonias do not have any administrative attributions, and as with most of the city's organization, there is no standard for the size, population or basic infrastructure to qualify as a colonia. To complicate things further, Mexico City inhabitants may sometimes call a colonia what is actually a collection of official colonias. Centro - Covers the historic downtown of Mexico City (centro histórico). Condesa - Artistic district notable by its Art Deco architecture. Roma - Beaux Arts neighbourhood next to Condesa, one of the oldest in Mexico City. Ciudad satélite - Middle to upper middle class suburban neighbourhood. Del Carmen - Historic, countercultural neighbourhood in downtown Coyoacán. Las Lomas - Upscale residential neighbourhood. Nápoles - Next to colonia del Valle, on both sides of Insurgentes avenue. San Ángel - Historic residential and shopping area. Santa Fe - Financial and business district. Jardines del Pedregal Upscale residential neighbourhood next to UNAM. Polanco - Shopping, business and tourist area. Tepito - Popular flea market. Tlatelolco - Site of the Plaza de las Tres Culturas and the Tlatelolco massacre. High-density residential neighbourhood. Villa Coapa - Middle class residential neighbourhood and shopping area. Zona Rosa - Shopping district and tourist area. The National Museum of Anthropology. Famous landmarks in Mexico City include the Zócalo (officially Constitution Square), the main central square with its time clashing Spanish-era Metropolitan Cathedral and Palacio Nacional, and ancient Aztec temple ruins Templo Mayor are all within a few steps of one another. (The Templo Mayor was discovered in 1978 while workers were digging to place underground electric cables.) The trademark golden Angel of Independence found on the wide, elegant avenue Paseo de la Reforma, modeled by the order of the Emperor Maximilian of Mexico after the Champs-Élysées in Paris. The Avenida de los Insurgentes, locally said to be the longest street in the world, goes 28.8 km (18 miles) from end to end of the city. The Chapultepec park houses the Chapultepec Palace museum on a hill that overlooks the park and its numerous museums, monuments and the national zoo; the National Museum of Anthropology (which houses the Aztec Calendar Stone), the Bellas Artes Fine Arts Palace which is a stunning white marble theatre/museum whose weight is such that it has gradually been sinking into the soft ground below, the Plaza of the Three Cultures in the Tlatelolco neighbourhood, and the shrine and Basilicas of Our Lady of Guadalupe. There is a double decker bus known as the "Turibus" that circles most of these sites, and has timed audio describing the sites in multiple languages as they are passed. In addition, the city has around 160 museums, over 100 art galleries, and some 30 concert halls. In many locales (The Palacio Nacional and the Instituto Nacional de Cardiología to name a few), there are murals by Diego Rivera. He and his wife Frida Kahlo lived in the southern suburb of Coyoacán, where several of their homes, studios, and collections are open to the public. Nearby is the house of Leon Trotsky, where he was murdered in 1940. In 1983 The Church of Jesus Christ of Latter-day Saints built the scenic Mexico City Mexico Temple here because of the large number of members in the area. In addition there are several restored Haciendas that are now restaurants such as the San Angel Inn, Hacienda de Tlalpan and the Hacienda de los Morales, all of which are stunning remnants of Mexican glory and house some of the best food in the world. "Fútbol" (soccer) is Mexico's most popular sport and has a wide following in Mexico City. Several very well known teams, including Club América, Cruz Azul and Pumas, are based in Mexico City. The Aztec Stadium (Estadio Azteca), home of Club America is one of the world's largest stadiums with capacity to seat approximately 110,000 fans. Atlante, the city's fourth club, also plays there. Mexico City also has an Olympic Stadium in Ciudad Universitaria, which is home of the Pumas soccer team. Cruz Azul plays in the Estadio Azul, which is located within Mexico City as well. Mexico hosted the Football World Cup in 1970 and 1986. Azteca is the only stadium in the world to host the final match of the Football World Cup twice. The Estadio Azteca was witness to a slew of spectacular games from all the sides involved. The excitement of Mexican fans was evident through their overwhelming attendance and emotional support of the games. Baseball is also another popular sport with a growing fan base. Mexico City is home to the Diablos Rojos de Mexico (Red Devils) of the Liga Mexicana de Beisbol, with the team playing their home games at the Foro Sol Stadium. The Red Devils used to share the stadium with the baseball club "Tigres" until the club moved to nearby Puebla. Mexico City hosted the 1968 Olympic Games, winning bids against Buenos Aires, Lyon and Detroit. Mexico City hosted the 1955 Pan American Games and then the 1975 Pan American Games after Santiago and São Paulo withdrew. Starting with the 2005 season, NASCAR will hold annual Busch Series races at Autodromo Hermanos Rodriguez. Drivers Carlos Contreras, Michel Jourdain Jr., Jose Luis Ramírez, and Adrian Fernandez enjoy a homecoming with the race; all are from Mexico City originally. In 2005, Mexico City became the first city to host a NFL regular season game outside of the United States, and has also hosted several NBA pre-season exhibition games along with exhibition matches among MLB teams at the Foro Sol. Other sports facilities in Mexico City are the Palacio de los Deportes indoor arena and Francisco Márquez Olympic Swimming Pool. 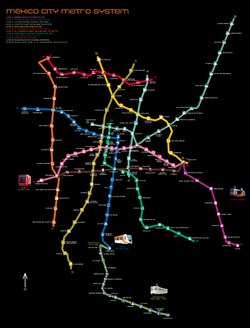 Mexico City is served by the Sistema de Transporte Colectivo Metro, an extensive metro system (207 km), the largest in Latin America, the first portions of which were opened in 1969. One of the busiest in the world, the metro transports more than 4 million people every day, surpassed only by Moscow's (7.5 million), Tokyo's (5.9 million), and New York City's (4.9 million). It is heavily subsidized, and it is the cheapest in the world, each trip currently costing MXN $2 (around EUR 0.13 or USD 0.19). A number of stations display Pre-Columbian artifacts and architecture that was discovered during the metro's construction. However, the Metro reaches only a fraction of the total inhabited area of the city, and therefore an extensive network of bus routes has been implemented. These are mostly managed by private companies which are allowed to operate buses as long as they adhere to certain minimal service quality standards. The city government also operates a network of large buses, in contrast with the privately operated microbuses, with fares barely exceeding that of the Metro. Electric transport other than the metro also exists, in the form of trolleybuses and the Xochimilco Light Rail line. The city's first bus rapid transit line, the Metrobús, began operation in June 2005 on Avenida Insurgentes. As the microbuses were removed from its route, it was hoped that the Metrobús could reduce pollution and decrease transit time for passengers. There are plenty of lime-green colored taxi cabs, which, while occasionally unsafe if taken randomly from the street instead of designated locales, are undeniably economical. Since late 2002, they have been joined by red and white taxis as part of a program to replace older vehicles with new ones. The freeway system is so dense that there is an ongoing project to complete a second level to the main ring road (the Periférico) that is currently already partially operational. Mexico City is served by Mexico City International Airport ( IATA Airport Code: MEX). The city has four major bus stations (North, South, Observatorio, TAPO), with bus service to cities across the country, and one train station, used for commercial purposes (intercity passenger trains are now virtually non-existent in Mexico). It was recently announced that a Tren Suburbano (suburban rail) will be built to serve the metropolitan area. There are also several toll expressways which connect Mexico City with several other major cities. The city does not have an expressway network that connects points within the city; all cross-city trips must be done on arterial roads. This is one reason why the city's streets are so congested. There is also a scheme, called Hoy No Circula ("day without a car"), whereby only vehicles with certain ending numbers on their license plates are allowed to circulate on certain days in an attempt to cut down on pollution and traffic congestion. The program groups vehicles by their ending license plate digits, and every weekday vehicles having any of the day's two "hoy no circula" digits are banned from circulating. For instance, on Fridays, vehicles with plates ending in 9 or 0 may not drive. The scheme is controversial since it has resulted in many better-off households having two cars instead of one, reducing the program's benefits; also, newer vehicles are exempt from complying with the program, a move said to have been pushed by auto makers to boost sales of new vehicles. Mexico City is home to a large community of immigrants - especially Europeans, largest European group are Spaniards, Jews (50,000), East Asian (600,000), Americans (500,000), Central American and Caribbean (1 million), and South American (800,000), especially Argentines (470,000). There's also a large community of Arabs (especially from Lebanon). A proof of this is the well-known Centro Libanés (Lebanese Center). A sport and cultural Center aimed at the Lebanese community, though a lot of members of this Sports Club are not of Lebanese descent. The Center has two facilities, one two blocks away from Insurgentes and another near San Ángel. They include a large theatre, various pools, tennis courts, game rooms, party rooms, Lebanese cuisine gourmet restaurants and tracks with football fields. Mexico City is the financial centre of Latin America and virtually every foreign and domestic corporation has operations in the city. It produces an amazing 25% of Mexico’s $815 billion economy making Mexico City alone the 30th largest economy in the world, and the third largest economy in Latin America. Also the GDP per capita is among the highest in Latin America reaching $15,000 dollars per capita, such high income is reflected virtually anywhere from first world image in most of the city. This is also reflected in wages, even in simple jobs like cashiers and bank tellers, the wage differencial between Mexico City and most of Latin America can be three times higher. Other economic and social indicators are revealing: 50% of the habitants of Mexico City have access to the internet, 58% own a cell phone, with virtually each househould have a phone line, and while 17% of Mexicans nationwide live in poverty, 15% of the residents of Mexico City do. Since the downturn of 2001, the economic base has shifted strongly, as the manufacturing activities move to the state of Mexico (Mexico city suburbs) this figures hit the GDP growth of the DF (federal district) while the state of mexico keeps growing at a strong pace. Since 2005 strong consumer spending, goverment spending and lower cost mortgage is spurring the economy not just of the DF but also the State of Mexico. Another interesting fact 78 of the top 100 exporters and 67 of the 100 importers are based in Mexico city metro area, the city exports to the rest of the world about $100 billon of dollars (about the same amount of imports, theres no reliable data), this is seen in all kind of imported goods available, from simple textiles, to luxury goods like Fendi, Louis Vuitton bags and Ferrari cars (the city hosts 2 ferrari-maserati dealers), while in exports, range from cars made in izcalli, to bubble gum, pharmaceuticals and several consumer goods like toothpaste and soaps, exported to central and South America. The vehicle market remains bouyant, with the cars registered in Mexico City growing a strong 10% yearly since 2000, meaning that about 400,000 cars are added to the roads of Mexico City each year. Extent of Mexico City within the Federal District as of 1994. As one of the largest urban areas in the world, Mexico City suffers from no shortage of the problems common to many large cities, including traffic, poverty, and pollution. This is perhaps exacerbated by Mexico's developing country status. This city has a high number of street children; some estimate as many as 50,000. 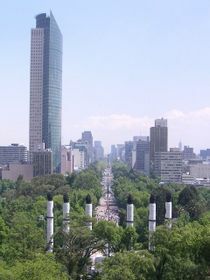 Mexico City has 7.9 million vehicles and 50 thousand factories, which release 24 thousand tonnes of pollutants per year. This has resulted in the city having the world's highest Ozone and Carbon Monoxide levels.The mountains and volcanoes surrounding the city trap polluted air in the city and contribute to the city's serious problem with poor air quality, although major strides have been made to improve the pollution situation in the past 20 years. Violent crime is also a major concern; in 2003, Mexico had the second-highest number of kidnappings in the world, with some 3,000 reported cases. In taxis, a particular problem has arisen; individuals are sometimes kidnapped by unauthorized taxi drivers, in order to empty their bank accounts at ATMs. Victims are sometimes kept overnight in order to bypass daily withdrawal limits. Inside other transportation, mostly microbuses, pickpocketing is still a common activity, and Mexico City inhabitants take various levels of precaution to avoid being victims of this. As a general rule, if you are unaware of the route you are to take then you should only use official taxis from stands ("sitios") as these are closely regulated. Police reform has also been a focus of the government for the past decade; there is a general sense of distrust against the authorities, as conventional wisdom holds that all Mexico's police forces are corrupt one way or another. This issue came to a head in November 2004, when an angry crowd in Tláhuac was whipped up into a frenzy and burned two undercover federal police officers alive and seriously injured another, on rumors that they were kidnappers. 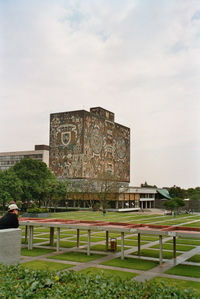 The library of National Autonomous University of Mexico. 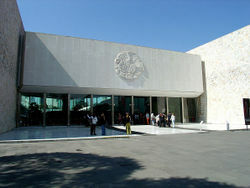 Mexico City is the location of National Autonomous University of Mexico (UNAM). UNAM is North America's oldest university (established in 1551) and for many years was the source of many presidents of the country. Other universities in the city include the Metropolitan Autonomous University (UAM), the National Polytechnic Institute (IPN), ITAM, ITESM (3 campi), Universidad La Salle, the Universidad del Valle de Mexico (UVM), Universidad Anáhuac, Universidad Iberoamericana and the American accredited Alliant International University. The curriculum of Mexico City's public schools is managed by the federal level Secretary of Public Education. However funding is allocated by the government of Mexico City. Because of its special situation as the home of the federal government, the local government of Mexico City has gone through several incarnations. Since independence, the city sometimes had an independent local government and other times (the greater part of the 20th century) was administered directly by the President of the Republic, who delegated his authority to a " Head of the Federal District Department", known more tersely as the regent. This kind of political organization caused much resentment among the inhabitants of the city because for many years they were deprived of a government that properly represented them. The most serious situation arose in 1988 when, despite having clearly voted for opposition candidates, the people of Mexico City were governed for six years by the party that won the federal presidency. Under these circumstances, political reform became inevitable. First a local legislative assembly was established, and people were able to elect their Head of Government (jefe de gobierno) for the first time (both institutions still had limited powers dependent on the federal congress and president). The first elected head of government was Cuauhtémoc Cárdenas, a former presidential candidate (who was, according to many, cheated out of victory in the closely fought 1988 presidential election). Cárdenas resigned later to compete in the 2000 presidential campaign and left in his place Rosario Robles, who became the first woman to govern Mexico City. A measure of the democratic development in Mexico is that the current (2000-06) chief of government in the Federal District is Andrés Manuel López Obrador of the PRD, which has a left-leaning ideology (and even has some former members of the Communist Party among its numbers), while at the same time, the federal government has a conservative president, Vicente Fox Quesada. López Obrador was deprived of his constitutional immunity as Head of Government in the Federal District on April 7, 2005. With 360 votes (489 total) from the Chamber of Deputies, he was impeached because he failed to obey a judge's order to stop a road from being built. This event is popularly called the "desafuero". This issue created a political crisis, which was resolved by the judiciary's ultimate decision to refrain from prosecuting López Obrador. On July 29, 2005 López Obrador resigned and left office to be able to run for the Presidency in 2006. Alejandro Encinas was appointed López Obrador's substitute as Head of Government. Torre Latinoamericana, Once Highest skyscraper in Latin America.